Wendy Kopp, the founder of Teach for America, shared her views on leadership in primary and secondary education Wednesday at Leverone Hall. Kopp was the first of three speakers that will make up the 2013 Contemporary Thought Speaker Series. 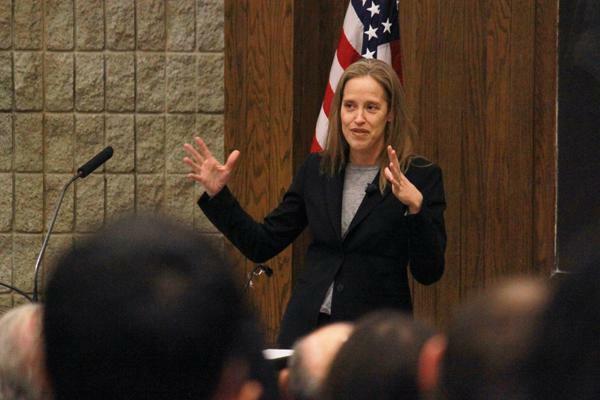 Wendy Kopp, founder of Teach For America, spoke Wednesday on campus about the role of leadership in primary and secondary education. About 200 students and faculty gathered in Leverone Hall for Northwestern’s 2013 Contemporary Thought Speaker Series event. Kopp discussed her past, founding TFA in 1990 and how far the organization has come. Kopp said she was excited to speak at NU, given the number of NU students who work for the organization every year. About 175 NU seniors applied to work at TFA this year, said Eliza McNabb, the organization’s recruitment manager for NU. Last year, 63 students joined the corps, making it the top medium-sized school contributing to TFA. Kopp conceived the idea for TFA while writing her senior thesis as a public policy major at Princeton University. Her idea was to aggressively recruit teachers from top universities, just like firms recruit investment bankers and consultants. Weinberg senior Liz Coda, an incoming TFA member, attended the event to learn more about the organization. She said she was attracted to TFA because she has always been interested in teaching and wants to experience it first-hand. Coda will start her TFA experience this summer, during a five-week program for teachers to learn and practice teaching methods. She will then teach secondary math in Philadelphia. During the school year, Coda said she will also be getting her teacher certification and a master’s degree in education from the University of Pennsylvania. Although she didn’t come to NU wanting to participate in TFA, Coda said she began to think about working for the organization her sophomore year. Both Coda and McNabb emphasized the importance of leadership experience in the recruitment process. While Coda acknowledged the program’s limitations — it’s only a two-year commitment and does not have a significant impact on the structure of the education system — she said she is interested in the program because it is a good way to make a tangible difference. “The way we see ourselves solving the problem of inequity is by getting a great teacher in the classroom,” McNabb said. At the end of the event, Kopp fielded questions from the audience, many of whom focused on how to incentivize joining the education profession instead of other careers. “The world needs you now, while you have inexperience and decades before you,” she said.